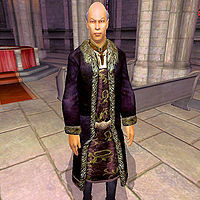 Tumindil is an Altmer priest who sells spells at the Great Chapel of Julianos in Skingrad. He sleeps in the chapel hall from around 2am until 8am and then walks around the chapel for the rest of the day. He offers his services all day, except when sleeping and for the first two hours after waking up. The other residents of Skingrad are evidently reassured by his presence. "I don't know if Tumindil ever leaves the chapel. That man works day and night to take care of all of us." and "Tumindil does excellent work. I always feel comfortable in his care." are two rumors that express their affection for him, but other residents will tell of his healing ability, suggesting that he shares that job with Marie Palielle. Some will say that "I went to the Chapel to get rid of a rash I'd picked up. Tumindil healed me right away." and others that "It's good to know that if I'm sick, I can head to Tumindil." Tumindil himself greets new arrivals politely, saying "Blessings of the Nine. My name is Tumindil. I'm the chapel priest. I'm sure you can find your way around the chapel by yourself." When asked about Skingrad he will direct you to Marie for healing and Restoration training: "The Chapel of Julianos is always open for worship and contemplation. Perhaps you should speak to Marie Palielle, our healer and Restoration trainer." He wears an upper-class outfit consisting of a black and burgundy outfit and gold-trimmed shoes, and holds a few gold coins. Tumindil doesn't wield any weapons, choosing instead to rely on spells from the Conjuration and Restoration schools of magic. These are the same spells you can buy cheaply off him, as his Mercantile is a mere 6. This page was last modified on 15 January 2016, at 03:01.